Stratospheric growth in China’s banking industry has been both a cause and an effect of the country’s rapid economic ascent over the past several decades from sleepy agrarian society to the world’s second-largest economy. More recently, that very growth has sparked concerns about financial-stability risk and excessive leverage, largely as the result of the rampaging credit expansion that prevailed in the country over the past decade. That leverage has become a concern, prompting Moody’s to downgrade China’s credit rating from Aa3 to A1 last year. 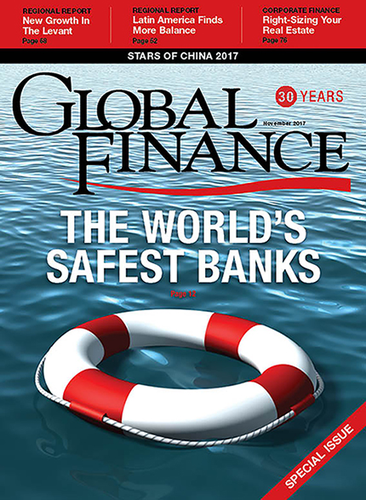 Clouding China’s banking outlook are fears that official statistics on nonperforming loans significantly understate the level of debt delinquency in the country’s banking system, concerns about the risk of tenor mismatch wherein long-term investments are supported by short-term funds, and the growth of China’s nonbank financial industry (the so-called shadow banks). Our annual Stars of China awards aim to provide a corporate navigating the mammoth Chinese market some reliable insights into the banking system’s players.While Chinese banks expand operations overseas, banks outside China are seeking to expand their opportunities in that market. The key takeaway regarding China’s banking system versus its Western peers is that the Chinese government is a key shareholder in the largest banks and without doubt would support them in times of systemic stress. China’s banking behemoths are seen as essential to the government’s strategy for fostering economic growth, even as further down the food chain a significant shake-up of the country’s banking industry is afoot. Smaller banks may be allowed to fail as increased competition takes hold, but that presents no threat to the status quo of dominance by the top-tier banks and the integrity of China’s financial system. At the top level, the sheer scale of China’s banking industry is breathtaking. It boasts the three largest banks in the world; the largest, ICBC, holds a mammoth $3.5 trillion in total assets, around $1 trillion more than either of its closest Western rivals—JPMorgan Chase and HSBC. Those rivals and their Western peers have reason for concern about protecting their market share; last year, the Big Three Chinese banks ramped up cross-border lending activities and are committed to emulating the universal banking model of the entrenched large Western banks. China’s big banks are on their way West. At the same time, the entry of foreign banks into China’s domestic banking system has brought a cultural shift toward best-practice norms. The beneficiaries of this shift are China’s domestic banks, which have grown ever more conscious of the profound competition they face, not only from the influence of external banking culture but also from the pressures of the fintech innovation. Underlying this dynamic have been two inescapable trends: the growth of financial technology and the growth of private- wealth management. As banking services in China are increasingly conducted via smartphones, the winners among the privately owned banks will be those offering the most customer-friendly service via such devices. The four biggest state-owned banks are equally cognizant of this development and have kept up with the dynamic as if their quasi-oligopolistic status did not exist. Meanwhile, a savage battle is taking place to capture assets from the high-net-worth segment, where the sheer scale of Chinese entrepreneurs’ investable cash has private banks falling over themselves to bid for the business. Against this backdrop, the families of super-rich patriarchs and matriarchs are engaged in estate and succession planning, another business line that is energizing China’s private banks and asset managers with earth-shattering force. The Stars of China 2017 awards aim to recognize the excellence of domestic entities that are breaking new paths in banking service worldwide, and innovating with new services, new business models, and new technologies. Of the Big Four Chinese banks, Bank of China has stamped its presence in international markets with the most conspicuous visibility. In those markets, the bank stands out not only above its domestic competitors but also against the Western competition. So in 2016, Bank of China captured almost half of the market for China syndicated loans as bookrunner, as well as 19% of the Asia-Pacific loan market (excluding Australia), almost a quarter of the market for dim sum bond issuance, and 8% for international renminbi bond issuance. The bank has explicitly pursued an international expansion strategy in the loan market by establishing global syndication teams in the major global financial trading centers. ICBC broke through the symbolic barrier of five million corporate accounts in March of this year, representing a staggering 400,000 increase year-on-year and a performance significantly ahead of its domestic competition. Asset quality continued to improve while corporate deposits hit RMB3.8 trillion ($4.5 trillion), the highest in five years. The bank optimized its client-service offering via the introduction of innovative small- and medium-enterprise (SME) financing plans and products and utilized the Bond Connect channel between Hong Kong and mainland China via inaugural issuance for China Unicom and Huaneng. ICBC also cemented its preeminence in the corporate-banking space in China by once again topping the underwriting space for Triple-A-rated corporate clients. DBS has established an extensive consumer-banking footprint in Asia, and China has been a key element of the bank’s mission statement to become the Asian bank of choice. DBS was one of the first foreign banks to incorporate locally in China a decade ago and has ridden the wave of the country’s economic growth by catering to China’s high-net-worth customers via its Treasures priority-banking service. Treasures Centers operate in China’s five major cities and serve around 50,000 customers. Its recent consumer-banking offerings include fixed-coupon and equity-linked investment under the QDII platform. The latter provides products linked to global equity markets yet localized via onshore fund management. Harbin Bank, successor to a bank established in 1921 and headquartered in China’s far northeast, in the province of Heilongjiang, has stamped its presence in the region via private-sector lending rather than lending to large state-owned enterprises, a more typical choice for its peers. The bank has innovated in the region by establishing, via a controlling shareholding, HB Leasing, the first financial leasing company in northeastern China. And it has approval to establish HBCF, the first consumer-finance company in Heilongjiang Province. In 2016 net interest income grew 22%, net profit by 10% and total assets by 21%. Postal Savings Bank’s recent past has been supremely exciting. In 2015 the bank brought on board 10 strategic investors from both China and farther afield, building on the strengths already apparent in Postal Savvings Bank’s coverage of its 500 million–strong retail customer base via its nearly 40,000 outlets. This paved the way for a highly successful initial public offering in Hong Kong the following year, which represented the largest IPO over the past two years in terms of funds raised. The bank provides crucial services for a low-margin business serving small and medium-size enterprises that many other banks eschew. Recent advances in digital technology, such as mobile Internet, Big Data, cloud computing and smart terminals, have allowed Postal Savvings Bank to enhance service efficiency, cut costs and risk and maximize profitability. A strategy of building an integrated, multifunctional bank has been in place at China Construction Bank over the past few years; and the results are beginning to show, in terms of both domestic and international operations. The bank has been a trailblazer for financial reform and innovation in China’s free-trade zones and border areas and recently set up cross-strait renminbi clearance centers and Sino-ASEAN cross-border financial services centers. CCB has stood out for grasping the opportunities associated with renminbi internationalization via the acceleration of its global operational network. Expansion into Chile and Switzerland were notable milestones last year. The bank’s total overseas commercial banking assets rose 13% last year, while profits from overseas operations rose 32%, vindicating the bank’s internationalization strategy. Hangzhou-headquartered China Zheshang Bank (CZB) is growing rapidly in terms of assets and profitability—assets and profits rose in 2016 by 31.3% and 44% respectively—thanks to its approach to innovation. Recently introduced innovations include biometric facial-recognition technology and machine learning. The latter utilizes algorithms and deep learning technology to identify risks and marketing opportunities. CZB has also assembled a blockchain digital draft program, which enables fund liquidation in real time, saving time and capital costs. The bank stands out for its relatively low nonperforming-loan ratio in the small and medium-size enterprise segment—1.4% versus 1.8% for industry peers—as well as its commitment to emerging industries, wherein it has exposure to 12,000 Chinese SMEs. Neo Financial has been at the cutting edge of fintech innovation in China, on both the investor and the borrower sides, via its Neo Inclusive Finance asset management and Neo Online lending platforms, with the latter serving almost five million users in China. Neo Inclusive focuses on small and micro businesses, and on individual and rural customers. The global payments industry is experiencing super-fast growth, as countries move to becoming “cashless” societies. Consumers expect payment to be quick and painless, while retailers can use payment data to gain insight into the shopping behavior of their customers and integrate payments with loyalty programs. AsiaPay offers an Online Bonus Point Redemption and eInstalment Service that allows the redemption of bonus points from a credit card issued by a partnered bank as well as MemberPay, a tokenized payment service. The company has succeeded in offering a scalable and secure payment system and is one of the few epayment providers in Asia to have Payment Card Industry Data Security Standard Level 1 certification and a high uptime commitment of 99.9%. China Guangfa Bank was one of the earliest joint-stock commercial banks to be established in China, just less than 30 years ago. The bank sits in the top 100 banks globally in terms of Tier 1 capital and was one of the first to establish a transaction-banking structure at headquarters level, back in 2012. CGB’s transaction banking contains three major business segments: supply-chain financing, cross-border financing and cash management, enabling the bank to provide a comprehensive solution for the client’s entire business process. Products include remittances, letters of credit, trade financing, collection and guarantee. CGB currently has 1,687 correspondent banks in more than 128 countries and regions, and conducts business across a range of major currencies including US dollars, renminbi, euros, yen and British pounds. The People’s Bank of China launched a renminbi cross-border trade-settlement system in 2009 with the aim of facilitating international trade in renminbi for domestic customers. That year, DBS was granted approval to operate in the settlement scheme and currently operates a comprehensive range of settlement types including open accounts, collections and letters of credit. DBS frequently features in the PBOC’s top-performing banks in the renminbi cross-border settlement business. The bank facilitates the entry of foreign companies into the Chinese market and the expansion into Asia of Chinese companies. DBS has grown its export bills under letter of credit transaction volume from a multimillion dollar business to a multibillion dollar business in just five years. A highlight in recent years has been DBS’s pioneering role in the Shanghai pilot free-trade zone—it was one of the first foreign banks to obtain a license to open free-trade unit accounts via its FTZ branch. 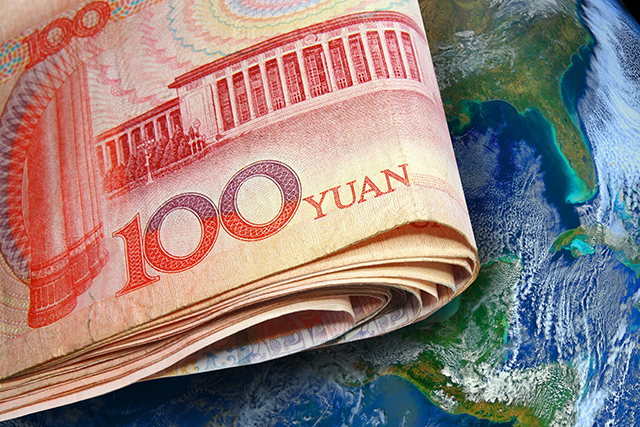 The renminbi underwent internationalization last year, as China opened up its capital markets via China Interbank Bond Market access, stock- and bond-connect programs and the inclusion of the currency in the Special Drawing Rights currency basket. Standard Chartered has been at the forefront of this process, having developed a range of China-access mechanisms as well as being the first commercial issuer to print in SDR—in late 2016 via SDR100 million ($137.2 million) of bonds. The bank has in recent years supported almost $1 billion of “One Belt, One Road” deals through more than 40 big-ticket deals for countries on the OBOR route. Standard Chartered is the only non-Chinese bank to offer global CNY (renminbi traded in New York) clearing, enjoying 25% growth in its CNY cross-border cash pool last year, and it has an estimated 10% market share in CNH (renminbi traded in Hong Kong) foreign-exchange options trading. The bank’s position at the center of the renminbi internationalization push is underlined by Standard Chartered’s CEO Bill Winters’s instrumental position in providing advice to China’s authorities on the process. Outbound mergers and acquisition activity from China has surged over the past two years and has been characterized by a depth of acquiring companies and deal size. In 2016 around $220 billion of outbound China M&A deals were closed across a range of industries from technology to entertainment. That period has seen Chinese companies and the banks that advise them on M&A becoming ever more sophisticated regarding local best practice, corporate culture and pricing. Still, since June, the environment has become challenging, given Beijing’s banking regulator ordering extra scrutiny of outbound M&A loans made to Chinese companies. Whatever the outcome of this extra vigilance, Bank of China has been at the forefront of the China M&A wave. A key transaction was the loan to fund a CITIC-led consortium’s $2.08 billion purchase of a majority stake in McDonald’s China and Hong Kong franchises. Bank of China’s Macau branch was a mandated lead arranger, and facility and security agent of the loan. Another highlight was acquisition funding arranged by Bank of China last fall to finance Carlyle Group’s purchase of a majority stake in business process outsourcer VXI Global Solutions. Ping An Bank has in recent years focused on gold importing, agency and proprietary trading—it is one of the world’s biggest spot gold traders—and leasing of the precious metal as well as structuring special products aimed at retail customers based on gold’s price. Ping An’s Gold Bank product, which focuses on gold monetization, has garnered more than three million users since launch. End users of the product can engage in long-term investing of short-term speculation in the metal. In addition, it has designed a floating-rate financing product that derives revenue from the shorting of gold put options. Standard Chartered has derived 38% of revenue in its commodities silo from business with China over the past year. Over the period, the bank added new underlying commodities to its precious-metals client offerings as well as exotic payoff structures. Standard Chartered also positioned itself in preparation for impending changes in capital and liquidity rules regarding collateral management. Meanwhile, the bank furthered strategic initiatives to expand its client base from core commodity companies such as miners and metal refiners to a broader industrial base. A key client solution structured by Standard Chartered last year is a Wai Bao Nei Dai cross-border security based on a structured deposit held at Standard Chartered in Hong Kong. ICBC is at the forefront of the burgeoning environment, social and corporate governance (ESG) movement among China’s financial institutions, with some key headline projects and transactions demonstrating its commitment to renewable energy and an ESG-conscious business model. Last year ICBC became the largest underwriter of green bonds in China, having sold RMB38.3 billion of green paper. ICBC has built a comprehensive financial-service system for direct financing in green products and has ticked the superlative box with a range of transactions. These include issuing RMB3 billion of green financial bonds for Industrial Bank—representing the first green financial bond in mainland China—RMB3 billion for the BRICS New Development Bank, and RMB2.5 billion for BAIC Motor, China’s first green corporate bond. ICBC in March innovated by leading China’s first green bond to finance biomass power generation, with a RMB1 billion green bond issued by State Grid Energy Saving Service. provider GarantiBank, demonstrating an impressive willingness to put in the credit work for a geographically distant borrower. Supply-side structural reforms in China have opened up a rich source of investment opportunities in the wealth-management industry, particularly in relation to direct financing. ICBC, as China’s largest asset manager, has grasped this opportunity, supported by depth in investment research, risk control, innovation and economies of scale. ICBC’s asset-management division has achieved an impressive compound annual growth rate of 13% for its clients over the past five years. Portfolios consist of a broad range of investment products across money markets, bonds, equities and alternative assets, as well as index and actively managed funds. The breadth of ICBC’s asset management is eye-opening: The bank has 20 subsidiaries holding asset-management licenses, from the mainland to Macau, Argentina, Turkey and Singapore. China Merchants Bank has made no secret of its ambitions to become the largest private bank in Asia; and given its current private-bank client base in China of 59,000, including $232 billion of assets under management onshore, the ambition is not merely a pipe dream. China Merchants Bank Private Banking is the largest in China by client assets and has achieved supercharged growth since entering the space two decades ago. The growth in AUM has been around 30% annually over the past two years. An interesting operational technique of automatically transferring any retail account of China Merchants Bank to the private bank when it reaches the equivalent of $1.5 million helps explain the phenomenal growth at the private-banking arm. The bank has an enviable cost-to-income ratio of 25% and characterizes its biggest cost as investment in fintech, with the bank’s financial-technology strategy run by a team dedicated to offshore system innovation. ICBC’s private-banking operation is conceived on a grand scale: It has more than 5,000 staff serving private-banking clients, with a core elite group of 300 serving ultra-high-net-worth customers in China. The bank’s appeal to millennials can be explained not only by its commitment to prudence, professionalism and confidentiality—enshrined in the private bank’s mission statement—but by its understanding of China’s burgeoning entrepreneurial culture. Tellingly in this regard, some seven out of 10 ICBC private-bank customers are entrepreneurs. The bank backs up its private-banking operation with other value-added services such as healthcare management, high-end forums, wealth-education courses, and arts and fashion events. In Asia, the families of ultra-high-net-worth founders have grown in size and complexity, and as a result, succession planning has become a matter of crucial significance. Private banks in the region now regard offering a family-service team as essential; and China Merchants Bank is no exception, offering estate-planning and business-succession advice to its private-banking clients. The bank’s W+ wealth-management business work platform has provided competitive advantage versus its peers as well as China Merchants’ Machine Gene Investment, which utilizes artificial intelligence to make asset-allocation decisions. Standard Chartered’s corporate social responsibility blueprint focuses on three priorities: contributing to sustainable economic growth, acting responsibly and investing in communities. In China, the bank runs a wide range of community programs under umbrellas such as Seeing Is Believing and Financial Education. The former provides funding to prevent avoidable blindness; the bank raised $6.5 million for this program last year; the latter focuses on building the financial capability of young people and micro entrepreneurs, and trained 106,000 young people and 1,020 entrepreneurs last year. China is also key to the bank’s worldwide efforts to support sustainability in its financing activities. Of the $240 billion that Standard Chartered lent worldwide in 2016, some $800 million went into clean technology, and another $400 million to microfinance institutions. China is also a critical node in the bank’s internal efforts to support long-term thinking. Between 2008 and 2016, the bank reduced its energy consumption by 37%, and water and paper usage by 35% and 71%, respectively. Transactions conducted via smartphone in China are growing by a staggering average annual rate of more than 140% and are on track to exceed an annual total of $13 trillion by 2020. That growth is driven by the vast penetration of smartphones in China, where an estimated 620 million people own such a device. Tenpay and its competitor Alipay together control around 90% of the mobile-payments market, with the former owned by Tencent, one of China’s biggest Internet companies. Tencent focuses on instant messaging, gaming, blogs and a variety of wireless value-added services; its WeChat messaging service has nearly a billion active users. Tenpay, which enables users of these services to pay online, has around 26 million users, a number that is easily set for exponential growth, given the demographics. The One Belt One Road project is a development strategy announced by China’s President Xi Jinping in 2013 that seeks to revive the old Silk Road trading route that linked ancient China to the West with infrastructure investments of more than $1 trillion. OBOR covers 68 countries in Europe, East Africa, and continental and maritime Eurasia. Last year, China Merchants Bank joined with Standard Chartered in a New Silk Road Finance initiative, which offers six different comprehensive service systems on a global basis for Chinese companies that are expanding into OBOR countries, including trade and supply-chain finance, project finance, cash and treasury management and foreign exchange. The two banks will also cooperate on renminbi internationalization and bilateral investment treaties that impact multinationals. Standard Chartered is well placed versus its peers regarding the One Belt One Road project, having a history in Asia for more than 150 years and possessing the necessary skill set in infrastructure and public utilities: roads, rail, shipping, water and cable and electricity equipment. Over the past two years, the bank has been engaged in 20 projects located in these segments. Last year, Standard Chartered structured an OBOR project in Bangladesh to fund the construction of a 220 MW dual-fuel, combined-cycle power plant. The bank was sole arranger, structurer and ECA coordinator and worked closely with China National Machinery Import & Export Corporation on the project together with credit wrap providers Hermes and Sinosure.